If I’m reviewing one book, why are there four pictured? Well, as I’m sure you can tell from the titles of the other three, they’re all somewhat related. Silverwing, Sunwing, and Firewing are all part of the Silverwing series which follow the life of a bat named Shade. Let me tell you, I absolutely LOVED these books when I was in elementary school. 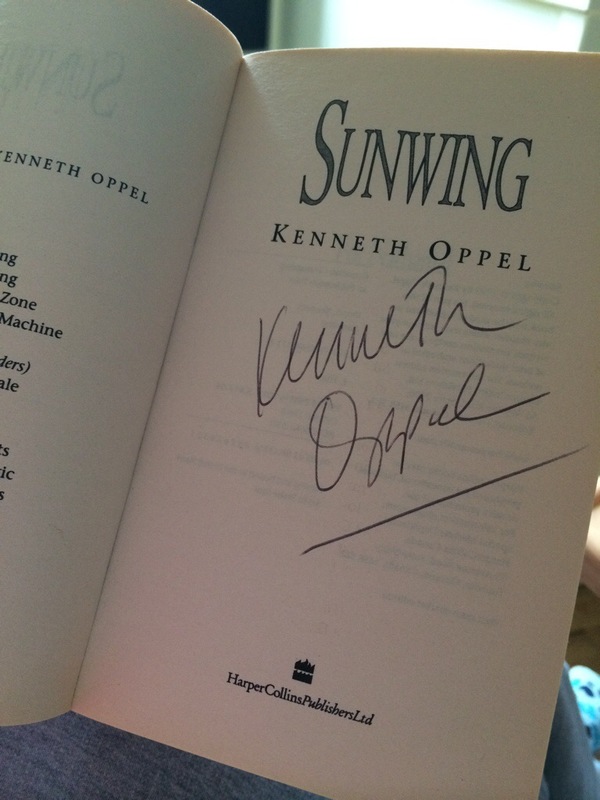 I read the Silverwing trilogy multiple times when I was younger and my signed books are my pride and joy and will probably remain on my shelf for many, many, many years to come, if not forever (it’s not exaggeration to say that they make me incredibly happy)! 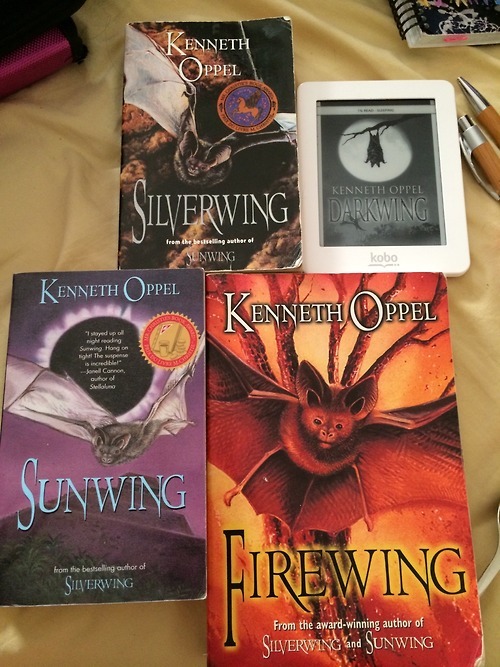 A few weeks ago, I discovered the Kenneth Oppel wrote more books not related to the Silverwing trilogy. (See: Goodreads – Kenneth Oppel) Naturally, this led me search Goodreads for his books and add a bunch of them to my TBR shelf. Imagine my surprise when I came across Darkwing and saw it listed as “Silverwing 0.5”. “While Dusk fights his urge to flap, Carnassial gives in to his instincts to become a vicious predator. The battle for survival has begun…” (Indigo) Although it’s a really short summary, it’s incredibly accurate. Darkwing is all about survival and what species have to and will do to ensure their safety. Having purchased and loaded Darkwing to my Kobo, I was, somewhat understandably, nervous. I loved the original series so much and was worried that this ‘0.5’ or prequel book let me down or ruin the series for me in a worst case scenario. I’m glad to report that it did neither! I really, really, really loved it. It reminded me so much of the Silverwing series that I loved reading so many years ago. What I absolutely loved most about Darkwing was that it sucked me right in to the story. So much so that, at dangerous or exciting points, I found that my heart was actually racing. My body was reacting as if I were actually running away or feared for my safety. I felt like I was a part of the chiropter colony. To go along with my emotional attachment to the story in general, I found the characters to be great. I felt for poor, little Dusk and really like rebellious and sassy Sylph as well. I disliked the guys that were intended to be the bad guys. I felt emotionally connected (be it negative or positive emotions) to all the characters. They’re animals but I had feelings towards them like I would for family, acquaintances, etc. in real life! Another aspect I thoroughly enjoyed was the separate story lines (until they converged, of course!). It kept it interesting because I knew they would intersect, it was just a matter of seeing how and what the final outcome would be. I’ve gushed a lot about what I loved about this book, which I admit were quite a few things. As for what I wasn’t such a huge fan of, I can really only think of one major thing and I’m not even sure I fully ‘disliked’ it. This will be a little vague, as I don’t want to spoil the ending for anyone. I’m both a fan of and strongly dislike the ending of this book. How is that possible? Well, the ending is very open for interpretation and letting your imagination run wild. Having read the Silverwing trilogy, that was pretty cool, because I started to imagine how the Darkwing story and the end of the novel would lead into Shade’s story in the series. The only reason this is a partial negative for me is my curiosity and dislike of not knowing things. A part of me really badly wanted to know exactly what happens to Dusk through his entire life. That is, of course, completely ridiculous and didn’t make me dislike the book. FINAL VERDICT: I would 500% read this book again and most likely combine it with rereading the Silverwing trilogy. I’ll even go as far as to say that, once I get a book budget set up, I’m definitely buying a hard copy of this book for my shelf. The e-book is nice to have, but I want a physical copy to sit on my shelf next to Silverwing, Sunwing and Firewing.